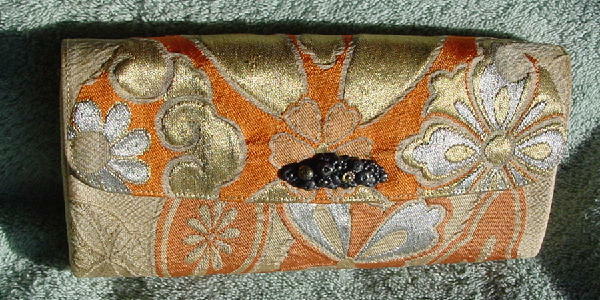 This never-used vintage fabric purse has a brocade surface. It has an envelope styling with a front flap one snap closure and the back has a side to side open pocket. 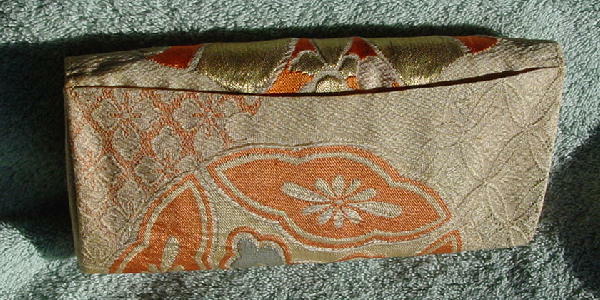 The interior has a champagne-peach tone-on-tone fabric lining (which was popular in the '60s). The front interior section has a back open pocket and a front open compartment with a 2 1/2" by 4" mirror which is attached to the pocket. 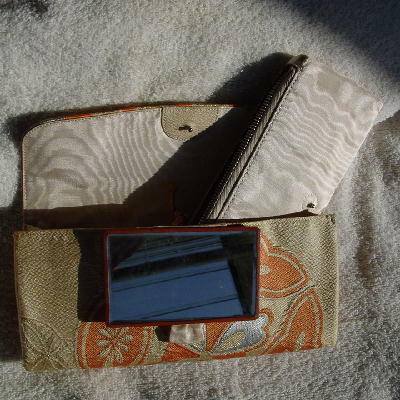 The center section holds a 7 1/2" by 3 1/4" zippered matching interior fabric (has some age spots) mini clutch, which snaps in place to the back of the center section. The exterior is in orange, silver, gold, and light peach on a light cocoa-bone base. The front flap has an elevated gold-tone and dark bronze ornament.